An End to Polio in Four Days? Durban — In moves dance festival organisers in this seaside city described as "verging on impossible", the hip-hop dancer's feet rarely touched the floor, as he used his hands, push-up style, to execute dazzling maneuvers. South Africa's cutting-edge international dance festival, Jomba!, is known for staging innovative shows. But Bosila Banya, known as B-Boy Junior, was a double sensation at this year's event – first with his athleticism and artistry and then with the revelation that he was disabled from childhood polio. The street dance style of B-boying, or breakdancing, began in the African-American community and spread worldwide. B-Boy Junior, ranked among the top hip-hop dancers internationally, is known increasingly for his imaginative choreography. The Jomba! program calls him one of two festival performers to "break new ground in the interface between theatre and streetdancing." Dance critic Kirsten Holder wrote on the Jomba! festival blog that any preconceptions about a dancer with limited use of his legs were confounded. "Breakdance requires a great deal of strength and co-ordination," she said, "and on both levels Junior's performance superseded any and all expectations." His saga is unusual. Born in the Democratic Republic of Congo (DRC) when it was still Zaire, he contracted polio, which consigns many children to a life begging in the street. But he was adopted at age five by a French couple and grew up near Paris. As a teenager, he realised that street dancers were mimicking the moves he had been making since childhood - walking and spinning on his hands. Within a few years he was winning contests, including the 2001 French breakdancing championship, dancing with the Wanted Posse crew, which went on to win the 2004 world championships in London. At Jumba!, when Junior paused in his routine and launched into a monologue, calling polio "this wicked disease", there were gasps of amazement. "The person next to me told me that he actually had polio," said 28-year-old Durban dancer Lerato Molefe." "When he was dancing, I didn't notice his leg," said 24-year-old dance student Levine Kyd. "But when he stopped, I could tell there was something wrong." B-Boy Junior's popular Youtube videos have sparked debate about the effects of his stunted legs on his dancing. Some of the discussion resembles the controversy over whether the carbon fibre lower limbs of South African sprinter Oscar Pretorius gave him an unfair advantage in Olympic trials. "Don't believe those idiots who are saying that he only can do all this stuff because his leg is lighter!" said a comment on Junior's dancing. "It isn't true, his legs have normal weight. Trust me, I met him and his legs are big." In an interview, Junior B-Boy said that although he hasn't been involved in the global campaign against polio directly, he has performed in hospitals and disability centres. "It can make me remember things about my own life - and it gives me power. I'm happy to do this." The worldwide campaign against polio - which remains endemic in four countries with sporadic outbreaks in others, including the DRC - has recently gathered greater momentum. Commonwealth leaders meeting in Perth, Australia last week pledged over $100 million from their governments to finally eradicate the disease. On the eve of the heads of government meeting, singer John Legend headlined an End of Polio concert in Perth, addressed via video by Bill Gates. Rotary International, which has championed the end-polio campaign, is soliciting U.S. $200 million to match a $355 million challenge grant from the Bill & Melinda Gates foundation. The cause is especially urgent, health experts say, with recent outbreaks in African countries. A medical state of emergency was declared at the end of last week in Angola after a child tested positive for the disease. He lives near the border with the DRC, where nine polio cases have been reported this year – which could lead to a new major spread of the disease if not contained, according to health officials. 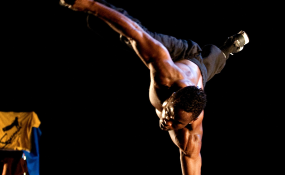 B-Boy Junior's appearance at the Durban contemporary dance festival drew from his return to DRC in 2008 for an artistic residency in the capital, Kinshasa. "Africa was a part of my life," he said in the interview. "I wanted to reconnect with my roots. I had questions in my head." "Even if he is one of the 10 best breakers in the world, even if he has known for a long time where he is heading," said the Jomba! organisers, "it is vital for him today to know where he comes from." The dance piece "Buanattitude" that B-Boy Junior performed, choreographed with the artistic collaboration of Olivier Le François, is his first effort to reflect artistically on his African roots. He used the complex solo work to explore both his fantasies about Africa and the realities he faced in Kinshasa. "My difference," he said, "I have accepted it for better and for worse. The worst part is when people want me to believe that I should be like everyone else." Additional interviews by Garret Brent.